I’ve got a thing for cherry trees. As I write this, a big cherry tree is in full bloom right outside my office window. It looks like daylight fireworks – tens of thousands of pale pink blossoms exploding exuberantly, about 30 feet from my desk. The Japanese have an enormous nation-wide cultural thing for cherry blossoms. During cherry blossom season, huge crowds of people go to the parks to enjoy them. Every night on national TV there are reports of how the season is progressing in different parts of the country. Pictures of cherry blossoms are on everything from kimonos to corporate logos. Every school child in Japan knows the cherry blossom song – Sakura, sakura. Part of the Japanese love for cherry blossoms is simply that they’re so beautiful – something beyond our human ability to make or build. It’s a beauty which stretches our sense of the divine, which connects us directly to God without any words or explanation being necessary. The other side of cherry blossoms, of course, is that they are fragile and only last a few days. A high wind or a late frost can wipe them away. 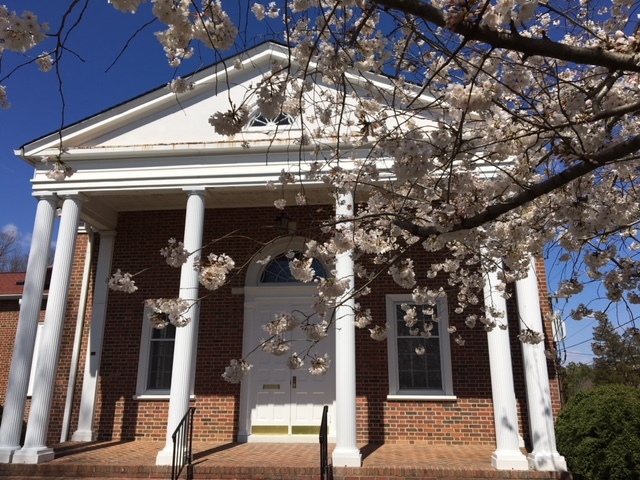 This year we had a long spell of unseasonably cool weather (for North Carolina) which made the cherry blossom season last longer than usual. We had a sleet storm last weekend and I thought they would all be gone, but it warmed up the next day and they bloomed more beautifully than ever before. For the Japanese, cherry blossoms are a symbol of life – how brief a time we have here on earth, how important it is to stop and appreciate moments of beauty, how much our souls yearn to connect with God. Sometimes I think that Quakers have it right, when we stop to listen or wait until God speaks, remembering the advice of London Yearly Meeting: “Take heed, dear Friends, to the promptings of love and truth in your hearts, which are the leadings of God.” At our best, Quakers are experts at noticing those “cherry blossom moments” in our individual lives and in our life together. In our not-so-good times, though, we forget that time is flying past, that a whole generation can come and go without our trying to really listen to them. We live in the past so much that we can completely miss the present, and do nothing to build for the future. 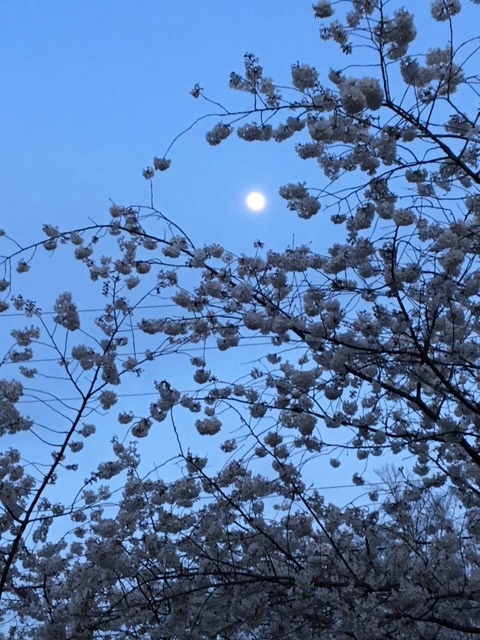 Yesterday evening I was walking home from our midweek Bible study and happened to look up and saw the full moon nestled in the top branches of the cherry tree. If I’d been walking along as usual with my nose to the ground I would have completely missed this transcendent moment, which brought me to a stop for at least ten minutes. It was a blessing beyond words. 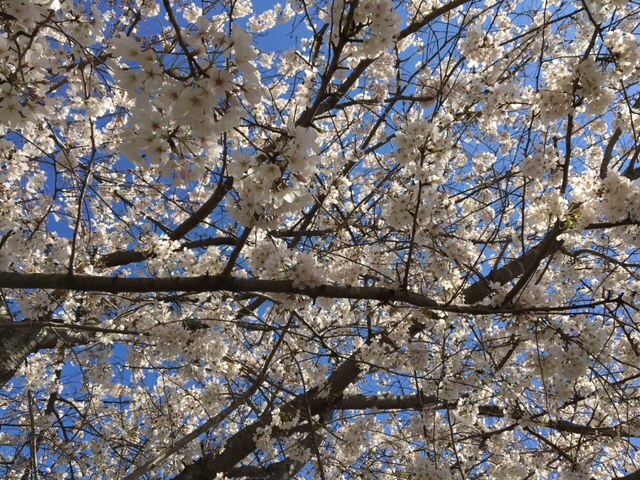 Even though the tree outside my office is still in full bloom, a few petals are already falling. There’s a beauty in that, too, when a light breeze makes the petals fall like rain, and children from the neighborhood go dancing through them with their hands reaching up toward the sky. There’s a beauty in old things (and older people) who have filled their lives with beauty and know the right time to fall to the ground. Yesterday when I went to open up for Bible study, a couple of dozen cherry petals blew in through the door to rest on the mat. Even in our indoor lives, God has a way of invading our space with beauty and with reminders to stop and enjoy. How nicely done is your article on Cherry Blossoms. Very thoughtful and meaningful. Thank you, Josh, for taking time to write this. Continuing revelation is such an important testimony for us, and keeps us oriented on the present. Perhaps there’s a way to add it to the SPICES? All of the posts on this blog are my own personal opinion. They do not necessarily reflect the opinions of the members and attenders of the meeting where I belong or any organization of Friends. For more information, click on the "About Me" tab above.